On Day Six which was a Monday set out on our Road Trip to Mammoth. On the way there it seemed that we stopped at numerous ‘Starbucks’ to get Lattés and for Monti and Kratae to use their ‘Birthday’ Coffees from Starbucks. Starbucks has a new ruling where you cannot use an American issued card in foreign countries so they had to use up the dollars and gifts on their cards while they were here. When we got to Bishop, I had a stop I wanted to make which was at Schatt’s Bakery which makes delicious Sheep Herder’s Bread. Along with the Sheep Herder’s we also bought Cheese Bread and Croissants. 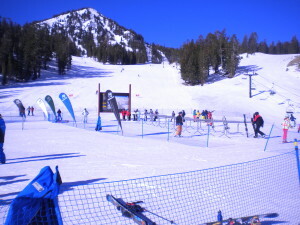 Next stop was Mammoth and our Condo in the Village. We had a two bedroom condo with a kitchen and two baths. The kitchen meant that we could make breakfast there instead of purchasing an expensive breakfast in the restaurants. Dinner that evening was at the ‘Smoke House’ where we all had ‘Pulled Pork’ Sandwiches and soft drinks. Breakfast the next day was Scrambled Eggs and Bacon and ‘Grandma’s Buns’ along with Coffee that the guys had purchased at the market. 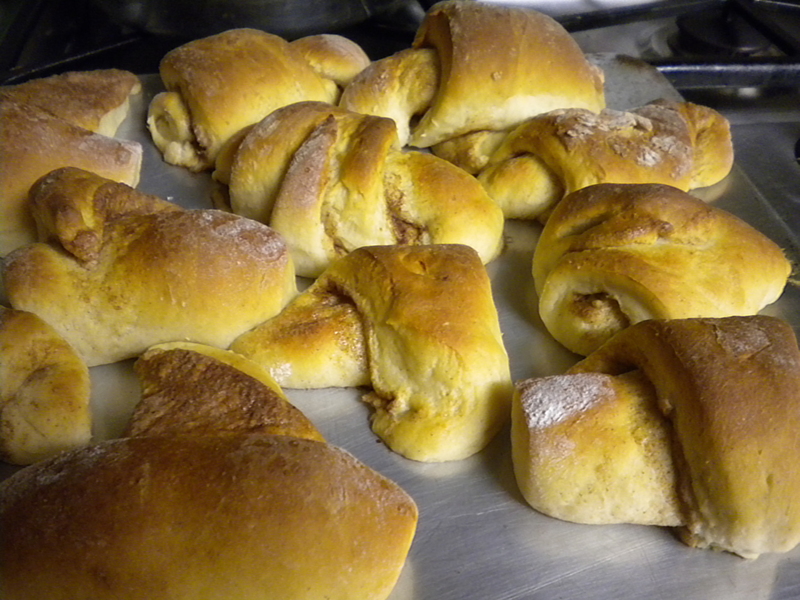 Grandma’s Buns are Cinnamon Rolls made like Croissants but in a small size. My Mother used to make these for the kids and now I do. Ski School was on the Agenda that day for Kratae; David went along to help her and Monti was there to record the event on Camera. (Kratae had never been in snow before) After a brief time of observing the action, Quinn and I went back to the Village and visited the different shops and had lunch with the gang at the Side Door Restaurant. For dinner that evening we did ‘Happy Hour’ at the Westin Hotel. Kratae had the Mini-Taco Trio and I had steamed Mussels. Various other small dishes were eaten by the rest of the crew. The next day was more skiing for David & Kratae and Monti decided to join the ski party. Quinn and I took the bus to town and walked around, did some shopping at the Bass Outlet and then took the bus back to the Village. We ended up for lunch at the Mexican Restaurant where Quinn had Chili Rellenos and I had the Appetizer Trio which consisted of Chicken Tenders, Mini-Corn Fritters and grilled jumbo Shrimp. That night it was dinner at the Side Bar where I had Minestrone (the strangest Minestrone I have ever had) and David and Quinn had Sandwiches. 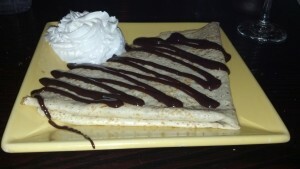 For Dessert I ordered the Crepes with Chocolate and shared them with Quinn and David.